Dressing during winter in Canada is a retailer's dream...we have to dress in layers, it's not just a fashion statement, it's essential for survival! 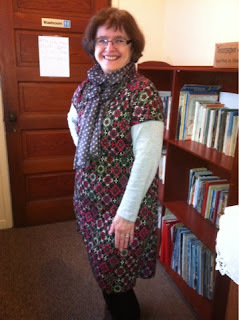 I was inspired by my mum's layering skills this past Sunday. 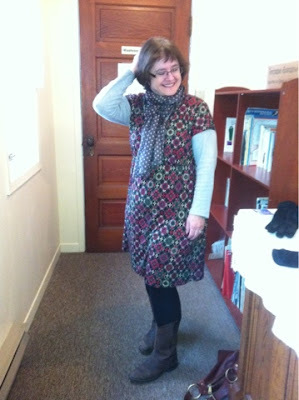 Not only did she look great, but she also pulled off that mid-calf boot with dresses trend that I just cannot do. Here's her response to "do a fashion blogger pose". I'd say she's got it down! She was not impressed I stopped her after church in the foyer for this mini photo shoot, but how could I not? Silk [polka dot] Scarf - Mono Prix, PARIS! She did not give me the deets on her opaque tights/leggings....I guess some information must be held sacred. Do you layer for Fashion or for Survival? What are your tips or favourite layering items? Ah, I love it! Your mum is looking fashionista fabulous!! She definitely has the layered look down pat. Gorgeous. I layer for survival too. It's a must! I'm pretty sure I said the Walmarts for the tights. haha. deb you look fabo! you need to include these over at lc. i'm gonna go put a sweater on now. and some boots. and maybe a scarf too. Can I use your photographs in an upcoming fashion post? I'll credit you. Great to see the lovely Deb in her Church finery! But the best thing is the smile - and that Parisian scarf! So...that is why you're blogging less. You took up modeling. Move over Gisele Bundchen or whatever your name is. There's Deb from LC now.